CONTEXT______This essay was written at the special request of his friend Toby Matthew in commemoration of an intimacy which had been tried by adversity and prosperity on both sides, and endured to the end without cloud or interpretation either. TEXT____IT HAD been hard for him that spake it to have put more truth and untruth together in few words, than in that speech, Whatsoever is delighted in solitude, is either a wild beast or a god. EXPLANTION_____Bacon opens his essay with a grand statement modelled after the views of Aristotle. Finding pleasure in solicitude is contrary to human character and mind. He expresses his belief in rather strong words. Anyone, who shuns fellow human beings and retreats to isolation, is degraded to the level of a wild beast. The other possibility is that he is god. For it is most true, that a natural and secret hatred, and aversation towards society, in any man, hath somewhat of the savage beast; but it is most untrue, that it should have any character at all, of the divine nature; except it proceed, not out of a pleasure in solitude, but out of a love and desire to sequester a man’s self, for a higher conversation: such as is found to have been falsely and feignedly in some of the heathen; as Epimenides the Candian, Numa the Roman, Empedocles the Sicilian, and Apollonius of Tyana; and truly and really, in divers of the ancient hermits and holy fathers of the church. Bacon, however, is not totally dismissive of people who assiduously shy away from the crowd, and head for the wilderness. Bacon realizes that remaining silent and cut off from others helps the mind to engage in deep contemplative thinking. Through such deep insightful dissection of mind, a person rediscovers himself. The truth and wisdom that dawn on the meditator’s mind through such prolonged isolation, can be profoundly rewarding for the hermit. The consequence can be both questionable or desirable. In case of Epimenides the Candian, Numa the Roman, Epimenides the Candian, Numa the Roman, Empedocles the Sicilian, and Apollonius of Tyana, the theories they propounded were somewhat non-confirmist for the commoners, but were of great philosophical value. Spiritual men who retreat from public eye in and around places of worship have been instrumental in delivering sermons of immense spiritual benefit to mankind. So, voluntary abstention from society is not always a bad idea, after all. But little do men perceive what solitude is, and how far it extendeth. For a crowd is not company; and faces are but a gallery of pictures; and talk but a tinkling cymbal, where there is no love. One must learn to differentiate between a crowd and kinship; between society and friendship. One can be lonely inside a multitude too. Faces of people may turn out to be fleeting pictures, if the persons are not engaged with. A conversation devoid of passion or feelings may be akin to the sounds of a tinkling cymbal – a barren monologue which hardly causes a ripple. The Latin adage meeteth with it a little: Magna civitas, magna solitudo; because in a great town friends are scattered; so that there is not that fellowship, for the most part, which is in less neighborhoods. But we may go further, and affirm most truly, that it is a mere and miserable solitude to want true friends; without which the world is but a wilderness; and even in this sense also of solitude, whosoever in the frame of his nature and affections, is unfit for friendship, he taketh it of the beast, and not from humanity. The Latin adage says, ‘Magna civitas, magna solitudo’. It means there is great solitude in a large city. This is so because people live in areas separated from one another by long distances. It makes it impractical to traverse such long distances to meet friends and relations. The large size of the city is, therefore, an impediment on the way of people cultivating friendship with one another. In a small city or town, people tend to live at a shorter distance from each other. So they befriend each other and live like a well-knit community. A principal fruit of friendship is the ease and discharge of the fullness and swellings of the heart, which passions of all kinds do cause and induce. A friendship must have feelings and passions as its main strands. It should be a bond between the hearts where one shares the emotions of his friend in full measure. We all know how debilitating and fatal heart ailments can be. Pleasant and intimate conversation with a friend brings back vigour to the heart. It elevates the mood, banishes depression and helps the heart patient to recover. There is no panacea for heart diseases which can match the curative value of the presence of good friends by the sick person’s bedside. Through lively chat and friendly banters, they unburden the heart of the sick person and make him feel good again. However, there are medicines or devices to correct a malfunction of internal organs like sarza for the liver, steel for the spleen, flowers of sulphur for the lungs, castoreum for the brain etc. It is a strange thing to observe, how high a rate great kings and monarchs do set upon this fruit of friendship, whereof we speak: so great, as they purchase it, many times, at the hazard of their own safety and greatness. Bacon then gives the examples of the monarchs and kings, and the elite who go to unusual lengths to befriend good and worthy people. The rich and the powerful with the reins of government in their hands seek out the crème of the society to give the pleasures of friendship. To bring in the good people, the kings and monarchs give them generous rewards through wealth and bestowal of honour. Such efforts to cultivate friendship can be fraught at times as the hand-picked friends may turn hostile causing harm to their benefactors. For princes, in regard of the distance of their fortune from that of their subjects and servants, cannot gather this fruit, except (to make themselves capable thereof) they raise some persons to be, as it were, companions and almost equals to themselves, which many times sorteth to inconvenience. A gulf difference always exists between the ruling elite and the subjects. The distance is so large that it cannot be bridged through normal means. At times, the princes develop liking for some individuals. To bring them nearer, the rulers raise their status and give them administrative powers. The intention is to win their friendship. However, such generosity and eagerness to elevate individuals to keep them in good humour may sometimes bring unanticipated harm. This becomes the possibility when the person chosen is intrinsically wicked in his intent. The modern languages give unto such persons the name of favorites, or privadoes; as if it were matter of grace, or conversation. The individuals entering the coterie of the sovereign are termed as ‘favourites’ or ‘privadoes’ in modern languages. These individuals merely add grace and give company like a friend. But the Roman name attaineth the true use and cause thereof, naming them participes curarum; for it is that which tieth the knot. But the true sense of the name is apparent in what the Romans called these individuals – ‘participes curarum’ meaning ‘sharer of cares’. They are the ones who share the anxiety and worries of the monarch and not just give company. These hand-picked favoured few are called ‘participes curarum’. It means ‘sharer of cares’, or those who share the anxiety and worries of the monarch. They are the close confidantes who offer their counsel to the rulers. It is this sharing of responsibilities/worries that builds the bond of friendship. And we see plainly that this hath been done, not by weak and passionate princes only, but by the wisest and most politic that ever reigned; who have oftentimes joined to themselves some of their servants; whom both themselves have called friends, and allowed other likewise to call them in the same manner; using the word which is received between private men. Such practice of co-opting some favoured individuals from among the subjects was followed not only by weak or emotional rulers, but also by very capable and hard-nosed ones having formidable strength and political acumen. The kings address these members of the coterie very graciously as ‘friends’, and they ask other members of the royalty and bureaucracy to address them so. Sylla, when he commanded Rome, raised Pompey (after surnamed the Great) to that height, that Pompey vaunted himself for Sylla’s overmatch. For when he had carried the consulship for a friend of his, against the pursuit of Sylla, and that Sylla did a little resent thereat, and began to speak great, Pompey turned upon him again, and in effect bade him be quiet; for that more men adored the sun rising, than the sun setting. Pompey was designated as ‘Pompey, the Great’ by Sylla, the ruler of Rome. Sylla raised his friend Pompey to such great heights by naming him “Pompey the Great”, that Pompey praised and boasted about being superior to Sylla. So much so that on one occasion when Sylla resented Pompey’s decision, Pompey publicly reminded Sylla that more men adored the sun rising, than the sun setting hinting that he had more clout and power than Sylla. With Julius Caesar, Decimus Brutus had obtained that interest as he set him down in his testament, for heir in remainder, after his nephew. And this was the man that had power with him, to draw him forth to his death. For when Caesar would have discharged the senate, in regard of some ill presages, and specially a dream of Calpurnia; this man lifted him gently by the arm out of his chair, telling him he hoped he would not dismiss the senate, till his wife had dreamt a better dream. And it seemeth his favor was so great, as Antonius, in a letter which is recited verbatim in one of Cicero’s Philippics, calleth him venefica, witch; as if he had enchanted Caesar. Brutus had, slowly made his way to Ceaser’s heart. He was Ceaser’s closest confidant and advisor. As a reward of the enduring companionship provided by Brutus, Ceaser in his will had made Brutus his heir after his nephew. Brutus had cast a spell over Ceaser, an influence the latter never suspected as wicked. This was to become Ceaser’s nemesis later. Ceaser had all but dismissed the senate because some ill omen portended a calamity. His wife’s deadly dream about an impending danger strengthened Ceaser’s desire to do away with the senate. Brutus stepped in at the last moment to prevail upon Ceaser to hold back his decision of discharging the senate until Culpurina (Ceaser’s wife) dreamt something better. So great was Brutus’s sway on Ceaser that in one of Antonius’ letter, mentioned by Cicero in his speech, Antonius has disparagingly called Brutus ‘venefica’– a witch, who had ‘enchanted’ Ceaser for evil designs. Augustus raised Agrippa (though of mean birth) to that height, as when he consulted with Maecenas, about the marriage of his daughter Julia, Maecenas took the liberty to tell him, that he must either marry his daughter to Agrippa, or take away his life; there was no third way, he had made him so great. Augustus elevated Agrippa high up in the royal hierarchy despite the latter’s mean birth (not from a noble family). Agrippa’s clout in the royal court had soared ominously. He was enjoying enviable privilege and power. When Agustus consulted the royal counselor Maecenas about the marriage of his daughter Julia, the counselor proffered an awkward advice. He suggested to Augustus to give his daughter in marriage to Agrippa. There was no way anyone else could win her hand with Agrappa around. If this was not agreeable to the emperor, he would have to eliminate Agrippa. There was no third option. With Tiberius Caesar, Sejanus had ascended to that height, as they two were termed, and reckoned, as a pair of friends. Tiberius in a letter to him saith, Haec pro amicitia nostra non occultavi; and the whole senate dedicated an altar to Friendship, as to a goddess, in respect of the great dearness of friendship, between them two. The friendship between Tiberius and Sejanus is another example of the perils of water-tight friendship. Sejanus charmed Tiberius and became his most intimate companion. As a result, Sejanus began to enjoy unprecedented privileges and stature. People perceived them as an inseparable pair. In a letter to Sejanus Tiberus had declared boldly that he had not hidden from anyone the details of their enduring friendship. The senate sensed the mood and dedicated an altar to their friendship as if their companionship was as sublime as a goddess. The like, or more, was between Septimius Severus and Plautianus. For he forced his eldest son to marry the daughter of Plautianus; and would often maintain Plautianus, in doing affronts to his son; and did write also in a letter to the senate, by these words: I love the man so well, as I wish he may over-live me. Now if these princes had been as a Trajan, or a Marcus Aurelius, a man might have thought that this had proceeded of an abundant goodness of nature; but being men so wise, of such strength and severity of mind, and so extreme lovers of themselves, as all these were, it proveth most plainly that they found their own felicity (though as great as ever happened to mortal men) but as an half piece, except they mought have a friend, to make it entire; and yet, which is more, they were princes that had wives, sons, nephews; and yet all these could not supply the comfort of friendship. Here it needs to mention the historical background of some famous historical characters which Bacon has borrowed from historical sources. Francis Bacon proceeds to give other examples where friendships have turned sour due to ambition, greed, mutual suspicion and love for power. Julius Caesar and Decimus Brutus were great friends. Caesar’s meteoric rise to power, influence and popularity made Brutus uneasy. He feared that Caesar, if not checked, could neutralize the power of the Senate and become a dictator endangering Rome. To curb the over-ambitious Cesar, Brutus plotted against him. In this act, he had the support of a few Senators and Gaius Cassius Longius. Finally, Brutus had Caesar stabbed to death from the back in 44 BC. That great danger was on the way for Cesar was seen in a dream by his wife Calpurnia. She had warned her husband about the danger from the Senate. Brutus had profound influence over Caesar. He had successfully prevailed upon Caesar not to undermine the Senate until his wife saw a happier dream. Antonious, a confidante of Calpurnia, loathed Brutus. He had described him as a vile person who had swayed Cesar to his side. Despite all these warnings, Cesar had trusted Brutus. He walked to the death trap laid inside the Senate chamber by Brutus and other conspirators. Bacon cites the example of the friendship between Augustus and Agrippa. The latter, apparently, was not of noble birth. Augustus befriended him and went to great lengths to elevate his status. When Augustus consulted the royal counselor Maecenas, the latter gave him two choices. Either he gave his daughter Julia in marriage to Agrippa or get him killed. So powerful Agrippa had become. He posed a real danger to Augustus. Thus, we see how people belonging to the real strata of society do not remain loyal to their benefactors despite all the favours bestowed on them. Bacon gives another example of intimate friendship degrading to hostility and revenge. He mentions the bond between Tiberius Caesar and Sejanus. Tiberius Caesar was very indulgent with Sejanus. Sejanus gradually accumulated power by taking advantage of his proximity to Tiberius. Sejanus also killed or neutralized potential political opponents, including the emperor’s son Drusus Julius Caesar When Tiberius withdrew to Capri in 26 BC, Sejanus assumed full control of the entire government as de facto ruler of the empire. Sejanus suddenly fell from power in 31BC, the year he became Consul. Rumours flew thick and fast that he was conspiring against Tiberius. Sejanus was arrested and executed, along with his followers. Thus a very enduring friendship ended in disaster due to mistrust. It has to be contrasted with the fact that Tiberius had, at one stage, asked the Senate to dedicate an altar to his friendship with Sejanus. Lastly, Bacon cites the case of the friendship between Septimius Severus and Plautianus. To cement their friendship, Severus conferred many honours on Plautianus which included a consular insigina, a seat in the Senate. He also made him a Consul. During his consulship, Plautianus’ image was minted on coins. He assisted Severus in doing the royal duties. In the process, he became very rich. His clout rose exponentially. Severus declared him to be his second in command. In 202BC, Plautianus gave his daughter Publia Fulvia Plautilla in marriage to Caracalla, the son of Severus. The influence of Plautianus soared soon after. As a result, the Roman Empress Julia Domna and Caracalla both began to feel insecure. The marriage between Caracalla and Publia Fulvia Plautilla was beset with problems between the two. In fact, Caracalla hated both his wife and his father-in-law. He threatened to kill both of them after becoming the emperor. When Plautianus discovered this, he began to think of ways to hatch a conspiracy to dethrone Severus’ family. To Plautianus’ ill luck, his treacherous plot was discovered. The imperial family of Servus summoned him to the palace and had him executed. Further acts of retribution followed his son after his death. Thus curtains came down on a friendship which had flowered so much only to wither away and turn to ashes. It is not to be forgotten, what Comineus observeth of his first master, Duke Charles the Hardy, namely, that he would communicate his secrets with none; and least of all, those secrets which troubled him most. Whereupon he goeth on, and saith that towards his latter time, that closeness did impair, and a little perish his understanding. Surely Comineus mought have made the same judgment also, if it had pleased him, of his second master, Lewis the Eleventh, whose closeness was indeed his tormentor. Comineus, a writer and diplomat who served under Duke Charles Hardy and later Louis XI of France has said in his writings that his former master, Duke Charles Hardy, would never share any secrets with anyone. He was particularly careful about not divulging any secret he considered critical to him and to his rule. But, age caught up with him. Gradually, his mental faculty deteriorated. A similar judgement can be made about the latter master, Louis XI, who was also a man of reclusive and suspicious nature. He too spent his last years in complete isolation. Bacon sights these examples to emphasize the importance of having a friend with whom one can share the joys and burdens of one’s heart. The parable of Pythagoras is dark, but true; Cor ne edito; Eat not the heart. Pythagoras advanced this idea ‘Cor ne edito’. It means ‘Eat not the heart’. Certainly, if a man would give it a hard phrase, those that want friends, to open themselves unto, are carnnibals of their own hearts. But one thing is most admirable (wherewith I will conclude this first fruit of friendship), which is, that this communicating of a man’s self to his friend, works two contrary effects; for it redoubleth joys, and cutteth griefs in halves. For there is no man, that imparteth his joys to his friend, but he joyeth the more; and no man that imparteth his griefs to his friend, but he grieveth the less. So that it is in truth, of operation upon a man’s mind, of like virtue as the alchemists use to attribute to their stone, for man’s body; that it worketh all contrary effects, but still to the good and benefit of nature. But yet without praying in aid of alchemists, there is a manifest image of this, in the ordinary course of nature. For in bodies, union strengtheneth and cherisheth any natural action; and on the other side, weakeneth and dulleth any violent impression: and even so it is of minds. Pythogoras had some harsh way of describing the hazards of keen friendship. He felt that a person may locate a worthy friend before whom he could unburden his worries. But, by doing this, he would be inadvertently decapitating (cannibalizing) his own heart. Such surrender of one’s self before even the closest friend might lead to undesirable consequences causing harm. Bacon goes on to conclude that nurturing intimacy excessively might prove to be a double-edged sword. In the plus side, it could enhance joy and reduce the grief encountered in day-to-day life. On the minus side, such happiness may be illusory. It is a fact that there is no man who has shared all his grief with his friend and realistically reduced his grief. Similarly, there is no man who has shared all the joys with a friend and experienced more joy. Like the alchemists miracle remedies which palliate pain despite warning of adverse effects, friendship might soothe suffering despite the risk of possible harm. In the same vein, a close look at Nature will show that a union of two elements results in better and more pleasant results. Human friendship has undoubtedly got some curative and embalming effects notwithstanding the risk of it turning foul. The second fruit of friendship, is healthful and sovereign for the understanding, as the first is for the affections. For friendship maketh indeed a fair day in the affections, from storm and tempests; but it maketh daylight in the understanding, out of darkness, and confusion of thoughts. Strengthening of personal affection and bonding apart, the other benefit is therapeutic (healing). It sharpens mental functions too. Friendship tempers down the ill effects of the storms of life, and brings sunshine and cheer to one’s life. It enables one to think clearly. Neither is this to be understood only of faithful counsel, which a man receiveth from his friend; but before you come to that, certain it is, that whosoever hath his mind fraught with many thoughts, his wits and understanding do clarify and break up, in the communicating and discoursing with another; he tosseth his thoughts more easily; he marshalleth them more orderly, he seeth how they look when they are turned into words: finally, he waxeth wiser than himself; and that more by an hour’s discourse, than by a day’s meditation. This does not mean that you will always get good advise from friends, but what it means is that the thoughts get jumbled up in the mind and there is not always the clarity in understanding them. However, when you communicate these thoughts to a friend by putting them in words, you get the clarity and understanding and become wiser simply by putting these thoughts in an orderly manner to make the right judgement. This is more beneficial then doing an entire day’s meditation. It was well said by Themistocles, to the king of Persia, That speech was like cloth of Arras, opened and put abroad; whereby the imagery doth appear in figure; whereas in thoughts they lie but as in packs. Neither is this second fruit of friendship, in opening the understanding, restrained only to such friends as are able to give a man counsel; (they indeed are best;) but even without that, a man learneth of himself, and bringeth his own thoughts to light, and whetteth his wits as against a stone, which itself cuts not. In a word, a man were better relate himself to a statua, or picture, than to suffer his thoughts to pass in smother. Arras was a place famous for its hand-woven textiles. These tapastries were rich ad beautiful. Themistocles once said that speech must be heard to be appreciated. This was akin to the tapestries from Arras that could be admired only when opened up and hung for people to feast their eyes on. Similarly, thoughts, when not opened up for propagation, remain locked in the mind of the thinker. This is like the rolled-up tapestry that lies in packs. People walk past them unaware of their great hidden beauty. This second fruit of friendship – good judgment and better understanding — is not restricted to opening up of your minds only to a few intelligent friends, although it is best when you do so. Even if the friend might not be intelligent enough, it nevertheless is beneficial to expound the thoughts before him. By doing this, one can understand them, and possibly throw more light on them. This could sharpen his intelligence. It is like the way we sharpen a tool by rubbing it against a rough stone. Obviously, Bacon compares the thinker with the tool and the not-so-intelligent listener as the rough stone. In short, it means a man better say his thoughts to a statue than to bury them in the mind and suffer suffocation. Add now, to make this second fruit of friendship complete, that other point, which lieth more open, and falleth within vulgar observation; which is faithful counsel from a friend. Heraclitus saith well in one of his enigmas, Dry light is ever the best. And certain it is, that the light that a man receiveth by counsel from another, is drier and purer, than that which cometh from his own understanding and judgment; which is ever infused, and drenched, in his affections and customs. Bacon proceeds to praise the advice that comes from well-meaning, un-biased, wise friends. Such advice seldom leads to undesirable consequences. If a person is guided by his own instincts, intuition and emotions, the judgment might be coloured, biased and one-sided. This might lead to difficulties. So, one must not be guided by one’s own understanding of the situation, and seek advice from wise friends. Heraclitus termed such independent advice from another person as ‘Dry light’. The drier it is, the more useful it can be. So as there is as much difference between the counsel, that a friend giveth, and that a man giveth himself, as there is between the counsel of a friend, and of a flatterer. For there is no such flatterer as is a man’s self; and there is no such remedy against flattery of a man’s self, as the liberty of a friend. Just as there is a big difference between the advice of a true friend and a man’s own judgement, so is there a difference between a well meaning advice of a true friend and that of a flatterer. But the man himself is the biggest flatterer of self, and the best remedy for this flattery is the freedom of a friend to give unbiased advice. Just the way one’s own judgment has to be sidelined in favour of an independent-minded advisor’s words, a sycophant’s counsel need to be treated with much less seriousness than one’s own decision in any matter. Bacon reminds the reader that a person’s own reading of himself could be minimally critical as it is human tendency not find fault with oneself. Because of such inherent weakness to feel good about him ignoring the many flaws of character and brain, a person must guard against the tendency to go by his own assessment and cast aside the wise counsel of other capable men. Counsel is of two sorts: the one concerning manners, the other concerning business. For the first, the best preservative to keep the mind in health, is the faithful admonition of a friend. The calling of a man’s self to a strict account, is a medicine, sometime too piercing and corrosive. Advice from a well-meaning wise friend can be for two principal reasons. It might be about a person’s manners and conduct and the second might be about his business. A friend’s criticism helps to keep the mind free of many undesirable thoughts and influences. Keeping a check on one’s own self may sometimes prove to be difficult. Reading good books of morality, is a little flat and dead. Observing our faults in others, is sometimes improper for our case. But the best receipt (best, I say, to work, and best to take) is the admonition of a friend. It is a strange thing to behold, what gross errors and extreme absurdities many (especially of the greater sort) do commit, for want of a friend to tell them of them; to the great damage both of their fame and fortune: for, as St. James saith, they are as men that look sometimes into a glass, and presently forget their own shape and favor. It is generally seen that people do not take much interest in reading good books on morality and good conduct. Learning by observing others’ mistakes may not be possible for some. But the best thing remedy that works and that one should take is the castigation of our good friends. It is strange to see how people, especially those who are powerful and wealthy, make blunders and damage their fame and fortune due to lack of well-meaning, balanced and neutral advice from good friends. The more powerful the person is, the higher will be his propensity to commit such mistakes. St. James had cautioned his followers about such self deception when one becomes blind to one’s own failings and weaknesses. As for business, a man may think, if he win, that two eyes see no more than one; or that a gamester seeth always more than a looker-on; or that a man in anger, is as wise as he that hath said over the four and twenty letters; or that a musket may be shot off as well upon the arm, as upon a rest; and such other fond and high imaginations, to think himself all in all. People often lose sight of the hard realities and their own infirmities after a few rounds of success. They argue that two eyes see no better than one eye, implying that they are able to reach the correct decision themselves and do not need other’s advice. In the same vein, they can say a gambler takes a better call than others watching the game. He can also claim that a musket can be fired from the arm as efficiently as from a rest. These thoughts are born out of boastfulness and ignorance. In the long run, such mindset can be highly damaging. But when all is done, the help of good counsel, is that which setteth business straight. And if any man think that he will take counsel, but it shall be by pieces; asking counsel in one business, of one man, and in another business, of another man; it is well (that is to say, better, perhaps, than if he asked none at all); but he runneth two dangers: one, that he shall not be faithfully counselled; for it is a rare thing, except it be from a perfect and entire friend, to have counsel given, but such as shall be bowed and crooked to some ends, which he hath, that giveth it. But when all is done, it is the good advice form a good counsel that sets the business straight again. One may think of taking advice in bits and pieces from different counsels. Although this is better than taking no advice at all, it is still not recommended as it has its own risks. Especially teo dangers; one, the advice may not be faithful, for faithful advice is a rare thing which only true friends give. So the advice may be manipulated in order to suit the person giving the advice. All good and competent advisors weigh the risks involved in a business correctly. They proffer their advice to the businessman with no fear or hesitation. A businessman can choose to seek advice from one friend over one issue, and from another friend over another issue. This is better than asking no advice at all, and choosing to go by one’s own intuition. But by choosing more than one advisor, a businessman may run into some risk. The advisor, realizing that there are other advisors like him, might be a little perfunctory in giving his advice. The other risk may be the possibility of getting biased and ill-intentioned advice. Unless the advisor is extremely good, loyal, principled, and wise, the advice, disguised as genuine, may turn out to be crooked. The other, that he shall have counsel given, hurtful and unsafe (though with good meaning), and mixed partly of mischief and partly of remedy; even as if you would call a physician, that is thought good for the cure of the disease you complain of, but is unacquainted with your body; and therefore may put you in way for a present cure, but overthroweth your health in some other kind; and so cure the disease, and kill the patient. Bacon now talks of another danger from advice from others. The counselor may have genuine intention to help the person in trouble, but may not have been able to study the matter properly. In such a case, he could give a drastic and upsetting advice with all the good intentions. Sadly, the result for the recipient may be harmful and even ruinous. This situation is similar to the one that results when an incompetent doctor, unaware of the patient’s medical history, prescribes the wrong medicines to the patient. The patient’s problems are aggravated leading to his death. But a friend that is wholly acquainted with a man’s estate, will beware, by furthering any present business, how he dasheth upon other inconvenience. And therefore rest not upon scattered counsels; they will rather distract and mislead, than settle and direct. So, Bacon concludes, a person must confide in a single counselor, who knows the ins and outs of his business. This is because he would be well-placed to give correct advice using his good understanding of the business. Seeking advice from multiple sources might be misleading rather than rewarding. After these two noble fruits of friendship (peace in the affections, and support of the judgment), followeth the last fruit; which is like the pomegranate, full of many kernels; I mean aid, and bearing a part, in all actions and occasions. 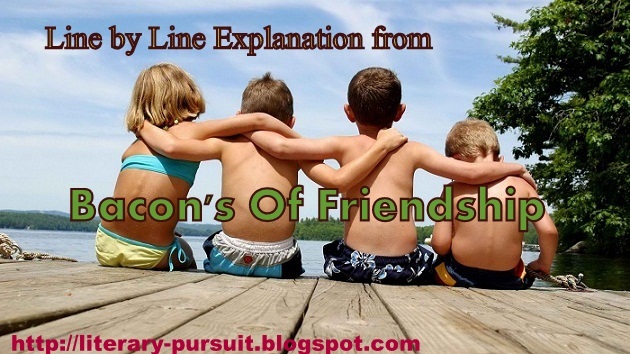 So far, we have learnt about two main benefits resulting from friendship. One relates to emotions, the other to understanding and judgement. In his concluding statement, Bacon talks about the third benefit which he likens to the pomegranate fruit that has so many kernels inside it. Friendship means helping and taking part in all actions and occasions of a friend. Here the best way to represent to life the manifold use of friendship, is to cast and see how many things there are, which a man cannot do himself; and then it will appear, that it was a sparing speech of the ancients, to say, that a friend is another himself; for that a friend is far more than himself. Men have their time, and die many times, in desire of some things which they principally take to heart; the bestowing of a child, the finishing of a work, or the like. The best way to explain the many uses of friendship is to see how many things there are in one’s life that one cannot do or confront alone. In ancient times, it was customary to call a friend as a replica of one’s self. In reality, a friend is more than himself. Men in their lifetime have many things to accomplish, many desires to fulfil which are close to their heart, like devoting to a child, or any other goals. If a man has a true friend, he may rest almost secure that the care of those things will continue after him. So that a man hath, as it were, two lives in his desires. A man hath a body, and that body is confined to a place; but where friendship is, all offices of life are as it were granted to him, and his deputy. For he may exercise them by his friend. When a man is blessed with a genuine, loyal and un-selfish friend, the latter will take care of his responsibilities after his death. He may care for his family, run his business, pay off his debts or do all those things left un-finished after the death of the man. Thus, a man’s life span gets prolonged. Then, comes the benefit accruing from delegation of authority. A person can’t be present in multiple places at any given point of time. In such a case, he may delegate the work in other places which his friend can visit and get things done. There are many things in life a person can’t do alone- be it in farming, trading, educating children, fighting off enemies etc. A good friend, like a trusted deputy, comes to the aid of his friend and smoothens his life. How many things are there which a man cannot, with any face or comeliness, say or do himself? A man can scarce allege his own merits with modesty, much less extol them; a man cannot sometimes brook to supplicate or beg; and a number of the like. But all these things are graceful, in a friend’s mouth, which are blushing in a man’s own. So again, a man’s person hath many proper relations, which he cannot put off. When trying to present his own merits before others, a person tends to become needlessly boastful, inviting derision from others. Alternatively, he may be too shy to present his own qualities with the praise they deserve. Similarly, while asking for a favour from others, he may feel very awkward. All these functions are best discharged by a loyal and capable friend. Thus, many functions in the society that are mandatory can be got done through a friend. A man cannot speak to his son but as a father; to his wife but as a husband; to his enemy but upon terms: whereas a friend may speak as the case requires, and not as it sorteth with the person. But to enumerate these things were endless; I have given the rule, where a man cannot fitly play his own part; if he have not a friend, he may quit the stage. A friend may be a good mediator or a go-between. When a message is to be communicated to an adolescent son or a peeved wife, or a stern enemy, a friend can do the job with aplomb and with great ease. Thus, the benefits of friendship are endless. A friendless, cut-off person is unfit to live in the society. The “dry light” of the friendly advice that characterized Francis Bacon’s The Essays, and which also gave us the excellent essay “On Beauty,” shines with particular power in his essay “On Friendship.” Here he does not delve into the nature of friendship, or into its moral aspect (as several philosophers and essayists have done, such as Montaigne, Kant and Emerson), but instead he moves straight to its usefulness, to the “fruits” that it brings to human beings. Those who do not have friends, “cannibalizes his own heart. ” And at the risk of going crazy, according to the writer. A principal fruit of friendship, is the ease and discharge of the fulness and swellings of the heart, which passions of all kinds do cause and induce. We know diseases of stoppings, and suffocations, are the most dangerous in the body; and it is not much otherwise in the mind; you may take sarza to open the liver, steel to open the spleen, flowers of sulphur for the lungs, castoreum for the brain; but no receipt openeth the heart, but a true friend; to whom you may impart griefs, joys, fears, hopes, suspicions, counsels, and whatsoever lieth upon the heart to oppress it, in a kind of civil shrift or confession. The second fruit of friendship, is healthful and sovereign for the understanding, as the first is for the affections. For friendship maketh indeed a fair day in the affections, from storm and tempests; but it maketh daylight in the understanding, out of darkness, and confusion of thoughts. Neither is this to be understood only of faithful counsel, which a man receiveth from his friend; but before you come to that, certain it is, that whosoever hath his mind fraught with many thoughts, his wits and understanding do clarify and break up, in the communicating and discoursing with another; he tosseth his thoughts more easily; he marshalleth them more orderly, he seeth how they look when they are turned into words: finally, he waxeth wiser than himself; and that more by an hour’s discourse, than by a day’s meditation.